Roast the chickpea flour lightly, stirring, until it smells fragrant, about 5 minutes on medium-low heat. Spray oil in a skillet. Add asafetida and sustard seeds. When the seeds sputter, add the onions. Saute until the onions turn translucent but before they start to color. Add the chilli powder, turmeric, spring onions and chopped green peppers. Saute for a few minutes until the vegetables start to soften. Add the chickpea flour and salt and stir in. Add 1 cup of water. Stir well, cover, and cook on medium-low heat about 7-8 minutes, stirring occasionally, until all the water has been absorbed. Turn off heat. Garnish with the garlic greens or coriander leaves. 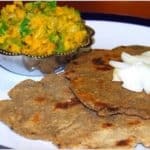 Serve hot with bhakri (recipe follows).